I love it when the pieces fall into place… even if it takes over 30 years. Resolving the true identity of that enterprise led to news accounts of a blaze that not only totally destroyed the building, it resulted in discussions about the equipment, operations, protocols, and resources of Riverton Fire Company that ultimately made it more efficient. The cabinet card remained misidentified as a photo of Main Street’s long-gone J.T. Evans Lumberyard for a while until historian Paul Schopp determined that it actually shows Woolston Carriage Works. Riverton’s 1919 Sanborn Insurance Map (sheets 3 and 12 seen merged here) shows the location of C.T. WOOLSTON WAGON M’F’Y. 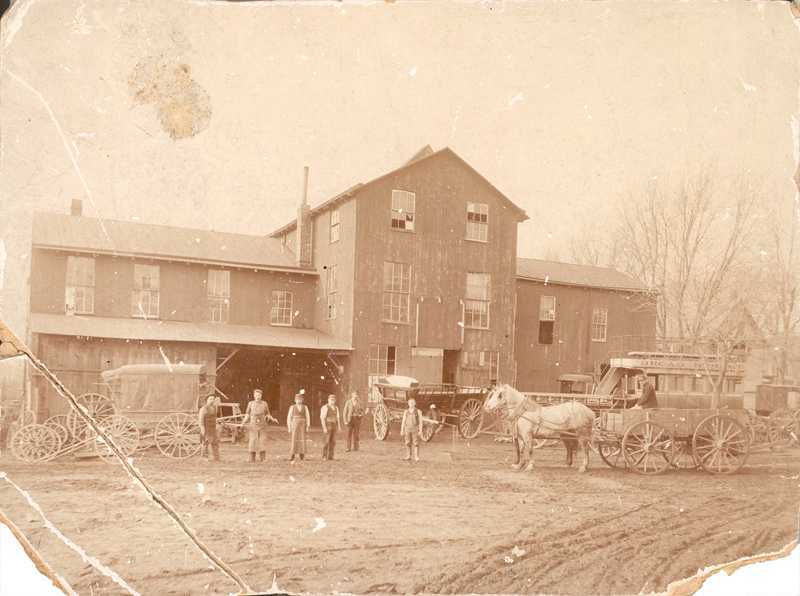 The wood-framed manufactory (so called, because it named a place where workers made things by hand) housed a blacksmith shop, wheelwright shop, power wood working machines, and rooms for painting and varnishing. Occupied recently with scanning and uploading to this website back-issues of the Society’s newsletter, the Gaslight News, I am struck with how often in them I find information about a topic that has somehow eluded me for so long. In June of 1921 Riverton had a fierce fire. The former Carriage Factory of Mr. Woolston, along 7th street below Main, caught fire, and the flames were so intense that several nearby houses were also damaged. Seventeen pieces of equipment were on hand, as neighboring towns responded to the call for assistance, and in the days following the fire, both Riverton and Palmyra companies seriously re-evaluated their own equipment and organization, which resulted in improved safety procedures for the communities. The former factory had been rented for about two years by a Philadelphia company that made automotive and truck bodies. For about a year it also manufactured, at this place, the Hilton, a coupe with wire wheels and a large rear deck. 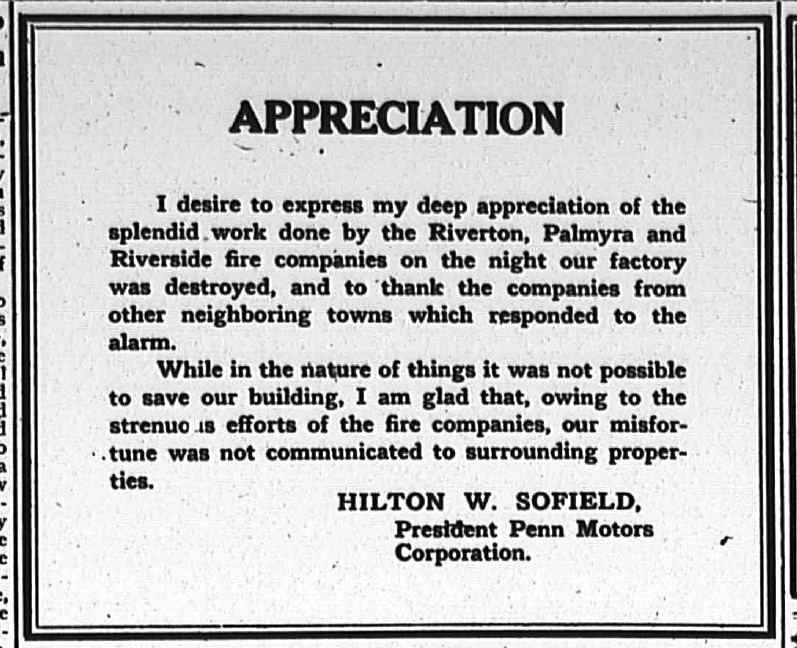 The car was named for Hilton W. Sofield, founder of the company, and the fire ended its production. A builder of horse-drawn carriages in Riverton sold out to an automobile manufacturer? And then the place burned down with no trace of it left today? Searching for a Riverton fire in June, 1921 led to a contemporary account of the conflagration in the June 17, 1921 issue of The New Era. Although the fire consumed the building and its tools and machinery along with sixteen trucks and two Hilton automobiles, fire crews saved several nearby homes. A gracious Penn Motors President Hilton W. Scofield thanked the fire companies and, in an interview, he expressed interest in building a new factory within six weeks. What often follows a ruinous fire at a business? Well, they didn’t call it that, but ads placed within days of the event mentioned “Sacrifice sale” and a 50% reduction on the price of Penn Motors trucks. A year after the fire a small article in an automobile trade publication announced the merger of Penn Motors Corp. and the Belmont Motor Co. of Lewistown, PA.
Further, four years later, the 1925 Sanborn Insurance Map shows four homes occupying the place where the factory stood. More than any other single person, Mrs. Betty B. Hahle’s work has contributed to the understanding of Riverton history we have today. From the mid-1970 through 2000, Mrs. Hahle wrote 100 of her signature “Yesterday” columns for Gaslight News, typing most of the masters herself. She would have loved knowing that today’s history lovers could learn from the embellished versions we offer today. Let us know what topics you would like to see further explored here. You know that saying, “When in doubt, throw it out”? Well, don’t do that with something that might help us fill in more pieces to the Riverton history puzzle. Great stuff, John! Fascinating that we had a role in the early auto age, if only briefly.